Shogi (将棋, shōgi) (/ˈʃoʊɡiː/, [ɕo̞ːŋi]), also known as Japanese chess or the Game of Generals, is a two-player strategy board game native to Japan in the same family as chess, makruk, shatranj, janggi and xiangqi, and is the most popular chess variant in Japan. 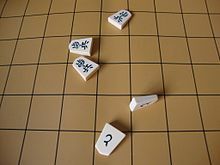 Shōgi means general's (shō 将) board game (gi 棋). Shogi was the earliest chess variant to allow captured pieces to be returned to the board by the capturing player. This drop rule is speculated to have been invented in the 15th century and possibly connected to the practice of 15th century mercenaries switching loyalties when captured instead of being killed. The earliest predecessor of the game, chaturanga, originated in India in the 6th century. Shogi in its present form was played as early as the 16th century, while a direct ancestor without the drop rule was recorded from 1210 in a historical document Nichūreki, which is an edited copy of Shōchūreki and Kaichūreki from the late Heian period (c. 1120). A traditional shōgi ban (shogi board) displaying a set of koma (pieces). The pieces on the far side are turned to show their promoted values. The stands on either side are komadai used to hold captured pieces. The board itself is raised for the comfort of players seated on tatami mats (background), and is hollowed underneath to produce a pleasing sound when the pieces are moved. Two players face each other across a board composed of rectangles in a grid of 9 ranks (rows) by 9 files (columns) yielding a 81 square board. [a] In Japanese they are called Sente 先手 (first player) and Gote 後手 (second player), but in English are conventionally referred to as Black and White, with Black the first player. The board is nearly always rectangular, and the rectangles are undifferentiated by marking or color. Pairs of dots mark the players' promotion zones. Several of these names were chosen to correspond to their rough equivalents in international chess, and not as literal translations of the Japanese names. Each piece has its name written on its surface in the form of two kanji (Chinese characters used in Japanese), usually in black ink. On the reverse side of each piece, other than the king and gold general, are one or two other characters, in amateur sets often in a different color (usually red); this side is turned face up during play to indicate that the piece has been promoted. Following is a table of the pieces with their Japanese representations and English equivalents. The abbreviations are used for game notation and often when referring to the pieces in speech in Japanese. Another popular style of shogi pieces different from the usual Japanese characters. Shows a 7-move tsumeshogi problem. White has pawns on 13, 24, 34; king on 23; and a promoted rook on 29. Black has a bishop on 44, a pawn on 17, a lance on 19, and a rook, two golds, and a silver in hand. An example set of "international" pieces. In this set, those pieces that do not have their equivalents in chess have symbols that iconically show their movement (e.g. the silver general's crown and ribbons point towards its possible directions of movement). English speakers sometimes refer to promoted bishops as horses and promoted rooks as dragons, after their Japanese names, and generally use the Japanese term tokin for promoted pawns. Silver generals and gold generals are commonly referred to simply as silvers and golds. The characters inscribed on the reverse sides of the pieces to indicate promotion may be in red ink, and are usually cursive. The characters on the backs of the pieces that promote to gold generals are cursive variants of 金 'gold', becoming more cursive (more abbreviated) as the value of the original piece decreases. These cursive forms have these equivalents in print: 全 for promoted silver, 今 for promoted knight, 仝 for promoted lance, and 个 for promoted pawn (tokin). Another typographic convention has abbreviated versions of the original values, with a reduced number of strokes: 圭 for a promoted knight (桂), 杏 for a promoted lance (香), and the 全 as above for a promoted silver, but と (a hiragana symbol for the syllable "to") for tokin. The suggestion that the Japanese characters have deterred Western players from learning shogi has led to "Westernized" or "international" pieces which use iconic symbols instead of characters. Most players soon learn to recognize the characters, however, partially because the traditional pieces are already iconic by size, with more powerful pieces being larger. As a result, Westernized pieces have never become popular. Bilingual pieces with both Japanese characters and English captions have been developed as have pieces with animal cartoons. Shogi starting setup; Black (at bottom) moves first. Each player sets up friendly pieces facing forward (toward the opponent). the rook in the same file as the right knight. In the third rank, the nine pawns are placed one per file. A furigoma 振り駒 'piece toss' is used to decide who moves first. One of the players tosses five pawns. If the number of tokins (promoted pawns, と) facing up is higher than unpromoted pawns (歩), then the player who tossed the pawns plays gote 後手 'white' (that is, getting the second move). Among amateur tournaments, the higher-ranked player or defending champion performs the piece toss. In professional games, the furigoma is done on the behalf of the higher-ranked player/champion by the timekeeper who kneels by the side of the higher-ranked player and tosses the pawn pieces onto a silk cloth. In friendly amateur games, a player will ask the opponent to toss the pawns out of politeness. Otherwise, the person who tosses the pawns can be determined by Rock–paper–scissors. After the piece toss furigoma, the game proceeds. If multiple games are played, then players alternate turns for who goes first in subsequent games. (The terms "Black" and "White" are used to differentiate sides although there is no difference in the color of the pieces.) For each turn, a player may either move a piece that is currently on the board (and potentially promote it, capture an opposing piece, or both) or else drop a piece that has been previously captured onto a square of the board. These options are explained below. Professional games are timed as in international chess, but professional shogi players are almost never expected to keep time in their games. Instead a timekeeper is assigned, typically an apprentice professional. Time limits are much longer than in international chess (9 hours a side plus extra time in the prestigious Meijin title match), and in addition byōyomi (literally "second counting") is employed. This means that when the ordinary time has run out, the player will from that point on have a certain amount of time to complete every move (a byōyomi period), typically upwards of one minute. The final ten seconds are counted down, and if the time expires the player to move loses the game immediately. Amateurs often play with electronic clocks that beep out the final ten seconds of a byōyomi period, with a prolonged beep for the last five. The usual goal of a game is for one player to checkmate the other player's king, winning the game. Most shogi pieces can move only to an adjacent square. A few may move across the board, and one jumps over intervening pieces. The lance, bishop, and rook are ranging pieces: They can move any number of squares along a straight line limited only by intervening pieces and the edge of the board. If an opposing piece intervenes, it may be captured by removing it from the board and replacing it with the moving piece. If a friendly piece intervenes, the moving piece must stop short of that square; if the friendly piece is adjacent, the moving piece may not move in that direction at all. A king (玉/王) moves one square in any direction, orthogonal or diagonal. A rook (飛) moves any number of squares in an orthogonal direction. A bishop (角) moves any number of squares in a diagonal direction. Because they cannot move orthogonally, the players' unpromoted bishops can reach only half the squares of the board, unless one is captured and then dropped. A gold general (金) moves one square orthogonally, or one square diagonally forward, giving it six possible destinations. It cannot move diagonally backwards. A silver general (銀) moves one square diagonally, or one square straight forward, giving it five possible destinations. Because an unpromoted silver can retreat more easily than a promoted one, it is common to leave a silver unpromoted at the far side of the board. (See Promotion). All pieces but the knight move either horizontally, vertically, or diagonally. These directions cannot be combined in a single move; one direction must be chosen. Every piece blocks the movement of all other non-jumping pieces through the square it occupies. If a piece occupies a legal destination for an opposing piece, it may be captured by removing it from the board and replacing it with the opposing piece. The capturing piece may not continue beyond that square on that turn. Shogi pieces capture the same as they move. Normally when moving a piece, a player snaps it to the board with the ends of the fingers of the same hand. This makes a sudden sound effect, bringing the piece to the attention of the opponent. This is also true for capturing and dropping pieces. On a traditional shogi-ban, the pitch of the snap is deeper, delivering a subtler effect. A player's promotion zone consists of the furthest one-third of the board – the three ranks occupied by the opponent's pieces at setup. The zone is typically delineated on shogi boards by two inscribed dots. When a piece is moved, if part of the piece's path lies within the promotion zone (that is, if the piece moves into, out of, or wholly within the zone; but not if it is dropped into the zone – see Drops), then the player has the option to promote the piece at the end of the turn. Promotion is indicated by turning the piece over after it moves, revealing the character of the promoted piece. A silver general, knight, lance, or pawn has its normal power of movement replaced by that of a gold general. A rook or bishop keeps its original movement and gains the power to move one square in any direction (like a king). For a promoted bishop, this means it is able to reach any square on the board, given enough moves. A king or a gold general does not promote; nor can a piece that is already promoted. When captured, a piece loses its promoted status. Otherwise promotion is permanent. A promoted rook ("dragon king", 龍王 ryūō) moves as a rook and as a king. Alternate forms: 龍, 竜. A promoted bishop ("dragon horse", 龍馬 ryūma) moves as a bishop and as a king. Alternate form: 馬. A promoted silver (成銀 narigin) moves the same as a gold general. Alternate forms: 全, cursive 金. A promoted knight (成桂 narikei) moves the same as a gold general. Alternate forms: 圭, 今, cursive 金. A promoted lance (成香 narikyō) moves the same as a gold general. Alternate forms: 杏, 仝, cursive 金. A promoted pawn (と金 tokin) moves the same as a gold general. Alternate forms: と, 个. Captured pieces are retained in hand and can be brought back into play under the capturing player's control. The Japanese term for piece(s) in hand is either 持ち駒 mochigoma or 手駒 tegoma. On any turn, instead of moving a piece on the board, a player may select a piece in hand and place it – unpromoted side up and facing the opposing side – on any empty square. The piece is then one of that player's active pieces on the board and can be moved accordingly. This is called dropping the piece, or simply, a drop. A drop counts as a complete move. A pawn, knight, or lance may not be dropped on the furthest rank, since those pieces would have no legal moves on subsequent turns. For the same reason, a knight may not be dropped on the penultimate (player's 8th) rank. Two Pawns (Japanese: 二歩 nifu): A pawn cannot be dropped onto a file (column) containing another unpromoted pawn of the same player (promoted pawns do not count). A player with an unpromoted pawn on every file is therefore unable to drop a pawn anywhere. For this reason it is common to sacrifice a pawn in order to gain flexibility for drops. Drop Pawn Mate (Japanese: 打ち歩詰め uchifudzume): A pawn cannot be dropped to give an immediate checkmate. (Although other pieces may be dropped to give immediate checkmate.) A pawn may, however, be dropped to give immediate check as long as it is not also mate. It is also permissible to mate a king with a pawn that is already on the board. 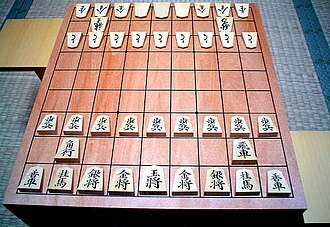 It is common to keep captured pieces on a wooden stand (駒台 komadai) which is traditionally placed so that its bottom left corner aligns with the bottom right corner of the board from the perspective of each player. It is not permissible to hide pieces from full view. It is common for players to swap bishops, which oppose each other across the board, early in the game. This leaves each player with a bishop in hand to be dropped later. The ability for drops in shogi give the game tactical richness and complexity. The fact that no piece ever goes entirely out of play accounts for the rarity of draws. When a player's move threatens to capture the opposing king on the next turn, the move is said to give check to the king and the king is said to be in check. If a player's king is in check, that player's responding move must remove the check if possible. Ways to remove a check include moving the king away from the threat, capturing the threatening piece, or placing another interposing piece between the king and the threatening piece. To announce check in Japanese, one can say ōte (王手). However, this is an influence of international chess and is not required, even as a courtesy. Announcing a check vocally is unheard of in serious play. The usual way for shogi games to end is for one side to checkmate the other side's king, after which the losing player will be given the opportunity to admit defeat. Unlike western chess or xiangqi, checkmate is almost always the end result in shogi since pieces never retire from play which gives the players a sufficient number of pieces to deliver checkmate. However, there are three other possible ways for a game to end: repetition (千日手 sennichite), impasse (持将棋 jishōgi), and an illegal move (反則手). The first two – repetition and impasse – are particularly uncommon. Illegal moves are also uncommon in professional games although this may not be true with amateur players (especially beginners). Unlike western chess, there is no tradition of offering a mutual draw by agreement. The losing player will usually resign when the situation is thought to be hopeless and may declare the resignation at any time during their turn. Although a player may resign just after they are checkmated, playing up to the checkmate point rarely occurs in practice as players normally resign as soon as a loss is deemed inevitable – such as when a tsume (forced mate sequence) is realized by the losing player. Similarly, if a player were to lose in an Entering King situation (see section below) by having less than 24 points (or by any of the other Impasse rules used by amateurs), then the player will usually resign before that point. In traditional tournament play, a formal resignation is required – that is, a checkmate is not a sufficient condition for winning. The resignation is indicated by bowing and/or saying 'I lost' (負けました makemashita) and/or placing the right hand over the piece stands. Placing the hand over the piece stand is a vestige of an older practice of gently dropping one's pieces in hand over the board in order to indicate resignation. In western practice, a handshake may be used. In professional and serious (tournament) amateur games, a player who makes an illegal move loses immediately. [c] The loss stands even if play continued and the move was discovered later in game. However, if neither the opponent nor a third party points out the illegal move and the opponent later resigned, the resignation stands as the result. In friendly amateur games, this rule is sometimes relaxed, and the player may be able to take back the illegal move and replay a new legal move. In particular, the Two Pawn violation is most common illegal move played by professional players. The Two Pawn violation played by Takahiro Toyokawa (against Kōsuke Tamura) in the 2004 NHK Cup is infamous since it was broadcast on television. On the 109th move, Toyokawa (playing as Black) dropped a pawn to the 29 square while he already had a pawn in play on the board on the 23 square and, thus, lost the game. If the same game position occurs four times with the same player to move and the same pieces in hand for each player, then the game ends in a repetition draw or sennichite (lit. "moves for a thousand days"), as long as the positions are not due to perpetual check. Perpetual check is an illegal move (see above), which ends the game in a loss in tournament play. In professional shogi, a repetition draw outcome is not a final result as draws essentially do not count. There can be only one victorious through wins. [d] In the case of a repetition draw, professional shogi players will have to immediately play a subsequent game (or as many games as necessary) with sides reversed in order to obtain a true win outcome. (That is, the player who was White becomes Black, and vice versa.) Also, depending on the tournament, professional players play the subsequent game in the remainder of the allowed game time. Thus, aiming for a repetition draw may be a possible professional strategy for the White player in order to play the second replay game as Black, which has a slight statistical advantage and/or greater initiative. For instance, Bishop Exchange Fourth File Rook is a passive strategy for White with the goal of a repetition draw (as it requires two tempo losses – swinging the rook and trading the bishops) while it is a very aggressive strategy if played by Black. Repetition draws are rare in professional shogi occurring in about 1–2% of games and even rarer in amateur games. In professional shogi, repetition draws usually occur in the opening as certain positions are reached that are theoretically disadvantaged for both sides (reciprocal zugzwang). In amateur shogi, repetition draws tend to occur in the middle or endgame as a result of player errors. The game reaches an Impasse or Deadlock (jishōgi) if both kings have advanced into their respective promotion zones – a situation known as 相入玉 (ai-nyū gyoku "double entering kings") – and neither player can hope to mate the other or to gain any further material. An Impasse can result in either a win or a draw. If an Impasse happens, the winner is decided as follows: each player agrees to an Impasse, then each rook or bishop, promoted or not, scores 5 points for the owning player, and all other pieces except kings score 1 point each. A player scoring fewer than 24 points loses. (If neither player has fewer than 24, the game is no contest—a draw.) Jishōgi is considered an outcome in its own right rather than no contest, but there is no practical difference. As an Impasse needs to be agreed on for the rule to be invoked, a player may refuse to do so and attempt to win the game in future moves. If that happens, there is no official rule about the verdict of the game. 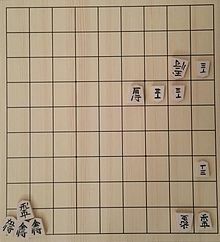 The first draw by Impasse occurred in 1731 in a bishop handicap game between the seventh Lifetime Meijin, Sōkan Itō II [ja], and his brother, Sōkei Ōhashi. As a practical matter, when an opponent's king has entered a player's own territory especially with supporting defending pieces, the opponent's king is often very difficult to mate given the forward attacking nature of most shogi pieces. This state is referred to as entering king (入玉 nyū gyoku). If both players' kings are in entering king states, the game becomes more likely to result in an impasse. In the adjacent diagram example, although White's king is in a strong Anaguma castle, Black's king has entered White's territory making it very difficult to mate. Therefore, this position favors Black. However, for amateur games there are various guidances with little standardization. Fairbairn reports a practice (considered a rule by the now defunct Shogi Association for The West) where the dispute is resolved by either player moving all friendly pieces into the promotion zone and then the game ends with points tallied. Another resolution is the 27-Point (27点法) rule used for some amateur tournaments. One version of this is simply the player who has 27 or more points is the winner of the Impasse. Another version is a 27-Point Declaration rule. For instance, the Declaration rule on the online shogi site, 81Dojo, is that the player who wants to declare an Impasse win must (i) declare an intention win via Impasse, (ii) have the king in the enemy camp (the promotion zone for that player), (iii) 10 other pieces must be in the promotion zone, (iv) not be in check, (v) have time remaining, and (vi) must have 28 points if Black or 27 points if White. If all of these conditions are met, then the Impasse declarer will win the game regardless of whether the opponent objects. Katoh played +N-36, and Nakahara then agreed to a draw via impasse. Katoh has 29 points, Nakahara 25 points. In professional tournaments, the rules typically require drawn games to be replayed with sides reversed, possibly with reduced time limits. This is rare compared to chess and xiangqi, occurring at a rate of 1–2% even in amateur games. The 1982 Meijin title match between Makoto Nakahara and Hifumi Katoh was unusual in this regard with an impasse draw in the first (Double Yagura) game on April 13–14 (only the fifth draw in the then 40-year history of the tournament). This game (with Katoh as Black) lasted for 223 moves with 114 minutes spent pondering a single move. One of the reasons for the length of this game was that White (Nakahara) was very close to falling below the minimum of 24 points required for a draw. Thus, the end of the endgame was strategically about trying to keep White's points above the 24-point threshold. In this match, sennichite occurred in the sixth and eighth games. Thus, this best-of-seven match lasted eight games and took over three months to finish; Black did not lose a single game and the eventual victor was Katoh at 4–3. Amateur players are ranked from 15 kyū to 1 kyū and then from 1 dan to 8 dan. Amateur 8 dan was previously only honorarily given to famous people. While it is now possible to win amateur 8 dan by actual strength (winning amateur Ryu-oh 3 times), this has yet to be achieved. Professional players operate with their own scale, from 6 kyū to 3 dan for pro-aspiring players and professional 4 dan to 9 dan for formal professional players. Amateur and professional ranks are offset (with amateur 4 dan being equivalent to professional 6 kyū). Shogi has a handicap system (like go) in which games between players of disparate strengths are adjusted so that the stronger player is put in a more disadvantageous position in order to compensate for the difference in playing levels. In a handicap game, one or more of White's pieces are removed from the setup, and instead White plays first. There are two common systems used to notate piece movements in shogi game records. One is used in Japanese language texts while a second was created for western players by George Hodges and Glyndon Townhill in the English language. This system was updated by Hosking to be closer to the Japanese standard (two numerals). Other systems are used to notate shogi board positions. Unlike chess, the origin (11 square) is at the top right of a printed position rather than the bottom left. In western piece movement notation, the format is the piece initial followed by the type of movement and finally the file and rank where the piece moved to. The piece initials are K (King), R (Rook), B (Bishop), G (Gold), S (Silver), N (Knight), L (Lance), and P (Pawn). Simple movement is indicated with -, captures with x, and piece drops with *. The files are indicated with numerals 1–9. The older Hodges standard used letters a-i for ranks, and the newer Hosking standard also uses numerals 1-9 for the ranks. Thus, Rx24 indicates 'rook captures on 24'. Promoted pieces are notated with + prefixed to the piece initial (e.g. +Rx24). Piece promotion is also indicated with + (e.g. S-21+) while unpromotion is indicated with = (e.g. S-21=). Piece ambiguity is resolved by notating which square a piece is moving from (e.g. N65-53+ means 'knight from 65 moves to 53 and promotes'). The Japanese notation system uses Japanese characters for pieces and promotion indication and uses Japanese numerals instead of letters for ranks. Movement type aside from drops is not indicated, and the conventions for resolving ambiguity are quite different from the western system. As examples, the western Rx24 would be 2四飛 in Japanese notation, +Rx24 would be 2四龍, S-21+ 2一銀成, S-21= 2一銀不成, and N65-53+ could be either 5三桂左成 or 5三桂右成 depending on whether the knight moved from the left or right. Although not strictly part of the notational calculus for games, game results are indicated in Japanese newspapers, websites, etc. with wins indicated by a white circle and losses indicated by a black circle. Like chess, however, the game can be divided into the opening, middle game and endgame, each requiring a different strategy. The opening consists of arranging one's defenses usually in a castle and positioning for attack, the mid game consists of attempting to break through the opposing defenses while maintaining one's own, and the endgame starts when one side's defenses have been compromised. In the adjacent diagram, Black has chosen a Ranging Rook position (specifically Fourth File Rook) where the rook has been moved leftward away from its starting position. Additionally, Black is utilizing a Silver Crown castle, which is a type of fortification structure constructed with one silver and two gold pieces and the king moved inside of the fortification – the silver crown name comes from the silver being positioned directly above the king's head on the 27 square as if it were a crown. In the diagram, White has chosen a Static Rook position, in which the rook remains on its starting square. This Static Rook position is specifically a type of Counter-Ranging Rook position known as Static Rook Anaguma that uses an Anaguma castle. The Anaguma fortification has the king moved all the way into very edge corner of the board on the 11 square as if it were a badger in a hole with a silver moved to the 22 square in order to close up the hole and additional reinforcing golds on 31 and 32 squares. This board position required 33 moves (or 12 move pairs as counted in western chess) to construct. Shogi piece sets may contain two types of king pieces, 王 (king) and 玉 (jewel). In this case, the higher classed player, in either social or genuine shogi player rank, may take the king piece. For example, in titleholder system games, the current titleholder takes the king piece as the higher. The higher-ranked (or older) player also sits facing the door of the room and is the person who takes the pieces out of the piece box. Shogi does not have a touch-move rule as in western chess tournament play or chu shogi. However, in professional games, a piece is considered to be moved when the piece has been let go of. In both amateur and professional play, any piece may be touched in order to adjust its centralization within its square (to look tidy). Taking back moves (待った matta) in professional games is prohibited. However, in friendly amateur games in Japan, it is often permitted. 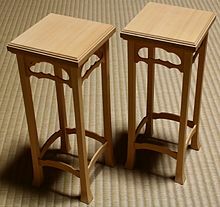 Professional players are required to follow several ritualistic etiquette prescriptions such as kneeling exactly 15 centimeters from the shogi board, sitting in the formal seiza position, etc. The world's first chess variant, chaturanga arose in India in approximately the seventh century AD. From there it migrated both westward and northward, mutating along the way. The western branch became shatranj in Arabia and Orthodox Chess in Europe. The northern branch became xiangqi in China and janggi in Korea. Sometime in the 10th to 12th centuries, 'chess' crossed the channel to Japan where it spawned a number of interesting variants. One of these was called 'Small Shogi'. Eventually, Small Shogi (though it went through many forms) won out over the larger variants and is now referred to simply as 'Shogi'. It is certain that Shogi in its present form was played in Japan as early as the 16th century. It is not clear when chess was brought to Japan. The earliest generally accepted mention of shogi is Shin Saru Gakuki (新猿楽記) (1058–1064) by Fujiwara Akihira. The oldest archaeological evidence is a group of 16 shogi pieces excavated from the grounds of Kōfuku-ji in Nara Prefecture. As it was physically associated with a wooden tablet written on in the sixth year of Tenki (1058), the pieces are thought to date from that period. These simple pieces were cut from a writing plaque in the same five-sided shape as modern pieces, with the names of the pieces written on them. The dictionary of common folk culture, Nichūreki (二中歴) (c. 1210–1221), a collection based on the two works Shōchūreki (掌中歴) and Kaichūreki (懐中歴), describes two forms of shogi, large (dai) shogi and small (shō) shogi. These are now called Heian shogi (or Heian small shogi) and Heian dai shogi. Heian small shogi is the version on which modern shogi is based, but the Nichūreki states that one wins if one's opponent is reduced to a single king, indicating that drops had not yet been introduced. According to Kōji Shimizu, chief researcher at the Archaeological Institute of Kashihara, Nara Prefecture, the names of the Heian shogi pieces keep those of chaturanga (general, elephant, horse, chariot and soldier), and add to them the five treasures of Buddhism (jade, gold, silver, katsura tree, and incense). Around the 13th century the game of dai shogi developed, created by increasing the number of pieces in Heian shogi, as was sho shogi, which added the rook, bishop, and drunken elephant from dai shogi to Heian shogi. The drunken elephant steps one square in any direction except directly backward, and promotes to the prince, which acts as a second king and must also be captured along with the original king for the other player to win. Around the 15th century, the rules of dai shogi were simplified, creating the game of chu shogi. Chu shogi, like its parent dai shogi, contains many distinct pieces, such as the queen (identical with Western chess) and the lion (which moves like a king, but twice per turn, potentially being able to capture twice, among other idiosyncrasies). The popularity of dai shogi soon waned in favour of chu shogi, until it stopped being played commonly. Chu shogi rivalled sho shogi in popularity until the introduction of drops in the latter, upon which standard shogi became ascendant, although chu shogi was still commonly played until about World War II, especially in Kyoto. Dai shogi was much less often played, but must have been remembered somewhat, as it is depicted in a woodcut by Kobayashi Kiyochika from around 1904 or 1905. It is thought that the rules of standard shogi were fixed in the 16th century, when the drunken elephant was removed from the set of pieces present in sho shogi. There is no clear record of when drops were introduced, however. In the Edo period, shogi variants were greatly expanded: tenjiku shogi, dai dai shogi, maka dai dai shogi, tai shogi, and taikyoku shogi were all invented. It is thought that these were played to only a very limited extent, however. Both standard shogi and Go were promoted by the Tokugawa shogunate. In 1612, the shogunate passed a law giving endowments to top shogi players (Meijin (名人)). During the reign of the eighth shōgun, Tokugawa Yoshimune, castle shogi tournaments were held once a year on the 17th day of Kannazuki, corresponding to November 17, which is Shogi Day on the modern calendar. The title of meijin became hereditary in the Ōhashi and Itō families until the fall of the shogunate, when it came to be passed by recommendation. Today the title is used for the winner of the Meijin-sen competition, the first modern title match. From around 1899, newspapers began to publish records of shogi matches, and high-ranking players formed alliances with the aim of having their games published. In 1909, the Shogi Association (将棋同盟社) was formed, and in 1924, the Tokyo Shogi Association (東京将棋連盟) was formed. This was an early incarnation of the modern Japan Shogi Association (日本将棋連盟, nihon shōgi renmei), or JSA, and 1924 is considered by the JSA to be the date it was founded. In 1935, meijin Kinjirō Sekine stepped down, and the rank of meijin came to be awarded to the winner of a Meijin title match (名人戦, meijin-sen). Yoshio Kimura (木村義雄) became the first Meijin under this system in 1937. 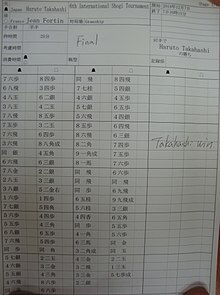 This was the start of the shogi title matches (see titleholder system). After the war other tournaments were promoted to title matches, culminating with the Ryūō title match (竜王戦, ryūō-sen) in 1988 for the modern line-up of seven. About 200 professional shogi players compete. Each year, the title holder defends the title against a challenger chosen from knockout or round matches. After the Second World War, SCAP (occupational government mainly led by US) tried to eliminate all "feudal" factors from Japanese society and shogi was included in the possible list of items to be banned along with Bushido (philosophy of samurai) and other things. 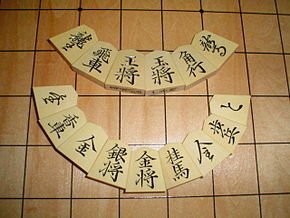 The reason for banning shogi for SCAP was its exceptional character as a board game seen in the usage of captured pieces. SCAP insisted that this could lead to the idea of prisoner abuse. But Kozo Masuda, then one of the top professional shogi players, when summoned to the SCAP headquarters for an investigation, criticized such understanding of shogi and insisted that it is not shogi but western chess that potentially contains the idea of prisoner abuse because it just kills the pieces of the opponent while shogi is rather democratic for giving prisoners the chance to get back into the game. Masuda also said that chess contradicts the ideal of gender equality in western society because the king shields itself behind the queen and runs away. Masuda’s assertion is said to have eventually led to the exemption of shogi from the list of items to be banned. The JSA recognizes two categories of shogi professionals: Professional (棋士, kishi), and Female Professional (女流棋士, joryūkishi). Sometimes kishi are addressed as seikishi (正棋士), a term from Go used to distinguish kishi from other classes of players. JSA professional ranks and female professional ranks are not equivalent and each has their own promotion criteria and ranking system. In 2006, the JSA officially granted women "professional status". This is not equivalent, however, to the more traditional way of "gaining professional status", i.e., being promoted from the "Shoreikai System" (奨励会): leagues of strong amateur players aspiring to become a professional. Rather, it is a separate system especially designed for female professionals. Qualified amateurs, regardless of gender, may apply for the "Shoreikai System" and all those who successfully "graduate" are granted kishi status; however, no woman has yet to accomplish this feat (the highest women have reached is "Shoreikai 3 dan league" by Kana Satomi and Tomoka Nishiyama), so kishi is de facto only used to refer to male shogi professionals. The JSA is the only body which can organize tournaments for professionals, e.g., the eight major tournaments in the titleholder system and other professional tournaments. In 1996, Yoshiharu Habu became the only kishi to hold seven major titles at the same time. For female professionals, both the JSA and LPSA organize tournaments, either jointly or separately. Tournaments for amateurs may be organized by the JSA and LPSA as well as local clubs, newspapers, private corporations, educational institutions or municipal governments for cities or prefectures under the guidance of the JSA or LPSA. Since the 1990s, shogi has grown in popularity outside Japan, particularly in the People's Republic of China, and especially in Shanghai. The January 2006 edition of Kindai Shogi (近代将棋) stated that there were 120,000 shogi players in Shanghai. The spread of the game to countries where Chinese characters are not in common use, however, has been slower. In Europe there are currently (November 2017) over 1,200 active players. Shogi has the highest game complexity of all popular chess variants. Computers have steadily improved in playing shogi since the 1970s. In 2007, champion Yoshiharu Habu estimated the strength of the 2006 world computer shogi champion Bonanza at the level of two-dan shoreikai. The JSA prohibits its professionals from playing computers in public without prior permission, with the reason of promoting shogi and monetizing the computer–human events. 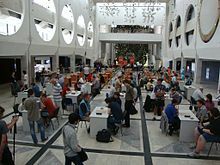 On October 12, 2010, after some 35 years of development, a computer finally beat a professional player, when the top ranked female champion Ichiyo Shimizu was beaten by the Akara2010 system in a game lasting just over 6 hours. On July 24, 2011, computer shogi programs Bonanza and Akara crushed the amateur team of Kosaku and Shinoda in two games. The allotted time for the amateurs was one hour and then three minutes per move. The allotted time for the computer was 25 minutes and then 10 seconds per move. On April 20, 2013, GPS Shogi defeated 8-dan professional shogi player Hiroyuki Miura in a 102-move game which lasted over 8 hours. The highest rated player on Shogi Club 24 is computer program Ponanza, rated 3455 on December 13, 2015. On April 10, 2016, Ponanza defeated Takayuki Yamasaki, 8-dan in 85 moves. Takayuki used 7 hours 9 minutes. In October 2017, DeepMind claimed that its program AlphaZero, after a full nine hours of training, defeated elmo in a 100-game match, winning 90, losing 8, and drawing two. From a computational complexity point of view, generalized shogi is EXPTIME-complete. Hundreds of video games were released exclusively in Japan for several consoles. The backwards uma (shogi horse symbol) is often featured on merchandise (such as on large decorative shogi piece sculptures, keychains, and other keepsakes) available for sale in Tendō. It is also serves as a symbol of good luck. (Cf. Rabbit's foot.) There are multiple theories on its origin. One is that uma (うま ) spelled in the Japanese syllabary backwards is まう mau (舞う), which means (to) dance and dancing horses are a good luck omen. In the manga series Naruto, shogi plays an essential part in Shikamaru Nara's character development. He often plays it with his sensei, Asuma Sarutobi, apparently always beating him. When Asuma is fatally injured in battle, he reminds Shikamaru that the shogi king must always be protected, and draws a parallel between the king in shogi and his yet-unborn daughter, Mirai, whom he wanted Shikamaru to guide. Shogi has been a central plot point in the manga and anime Shion no Ō, the manga and anime March Comes in Like a Lion, and the manga and television drama 81diver. In the manga and anime Durarara! !, the information broker Izaya Orihara plays a twisted version of chess, go and shogi, where he mixes all three games into one as a representation of the battles in Ikebukuro. In the video game Persona 5, the Star confidant is a high school shogi player looking to break into the ranks of the professionals. The player character will gain knowledge stat when spending time with the confidant, supposedly from learning to play shogi. The abilities learned from ranking up the confidant comes from Japanese shogi terms. In the light novel, manga, and anime The Ryuo's Work is Never Done!, protagonist Yaichi Kuzuryū is a prodigy shogi player who won the title of Ryūō at the age of 16. He is approached by Ai Hinatsuru, a 9-year-old girl who begs him to make her his disciple. Astonished by Ai's potential, Yaichi agrees to become her master, and the two then brave themselves together in the world of shogi with their friends and rivals. ^ Cf. the 64 square [8x8] board in western chess and the 90 intersection point board [9x10] in [xiangqi]). ^ The kanji 竜 is a simplified form of 龍. ^ This is in contrast to western chess, which usually allows correct with sometimes a less severe consequence of time penalty. However, the rules are complex. Cf. Rules of chess § Illegal move. ^ This is a significant difference from western chess, in which a player can play specifically to obtain draws for gaining points. ^ In shogi and western chess, the term move has different definitions, which may cause confusion for western chess players. In Japanese language texts, the term 手 te translated as "move" or "tempo" (as in 手数 tesū "number of moves") is defined as a single player moving their piece. However, in western chess, the English term move is defined as two players each moving their pieces once – in other words, a move-pair. Thus, the English shogi term move would be called a half-move in English chess terminology. On Wikipedia, we follow the shogi usage and not the chess usage for the term move. ^ a b "Shogi: Japanese Chess". The Chess Variant Pages. Retrieved 8 March 2012. ^ Hodges, George, ed. (1980). "Shogi history & the variants". Shogi. No. 27. pp. 9–13. ^ Fairbairn, John (1985), Shogi, in The Book of Games. New York, USA: Exeter Books ISBN 0-671-07732-5. ^ Grimbergen, Reijer. "Shogi Terms". www.shogi.net. Retrieved 22 July 2016. ^ a b Hosking 1997, p. 19–20. ^ Hodges, George, ed. (1982). "Who moves first?". Shogi. No. 40. p. 13. ^ "Hansoku". Shogi.or.jp. Retrieved 2018-06-05. ^ As shown on the 2005 NHK television special 大逆転将棋. ^ Fairbairn, John (1982). "Champions of past & present (2)". Shogi. No. 35. pp. 9–12. ^ 滝瀬, 竜司 [Takise, Ryuji] and 田中, 哲朗 [Tanaka, Tetsuro]. 2012. 入玉指向の将棋プログラムの作成 [Development of entering-king oriented shogi programs]. Information Processing Society of Japan, 53 (11), 2544–2551. ^ "将棋のルールに関するご質問｜よくある質問｜日本将棋連盟". Shogi.or.jp. Retrieved 2018-06-05. ^ "Rules and Manners of Shogi - 81Dojo Docs". 81dojo.com. Retrieved 2018-06-05. ^ "Shōreikai Gaiyō" 奨励会概要 [Outline of Shoreikai] (in Japanese). Japan Shogi Association. Archived from the original on 16 December 2008. Retrieved 21 September 2015. ^ "Title offset illustration". Retrieved 8 March 2012. ^ Hosking 1997, p. 20–21. ^ Hosking 1997, p. 263–265. ^ Hitoshi Matsubara, Reijer Grimbergen. "Differences between Shogi and western Chess from a computational point of view". Proceedings: Board Games in Academia. ^ Hosking 1997, p. 20. ^ a b "Sōritsu・Enkaku" 創立・沿革 [Founding and History] (in Japanese). 日本将棋連盟 (Japan Shogi Association). Archived from the original on 6 October 2014. Retrieved 16 August 2012. ^ Masuda, Kozo (2003). Meijin ni Kyosha wo Hiita Otoko 名人に香車を引いた男 [The Man Who Gave A Lance Handicap To A Meijin]. Chuokoron-Shinsha. p. 223. ISBN 978-4122042476. ^ "Enkaku" 沿革 [LPSA History] (PDF) (in Japanese). 日本女子プロ将棋協会 (Ladies' Professional Shogi-players' Association of Japan). Retrieved 26 June 2014. ^ "Nihon Joshi Puro Shōgi Kyōkai (LSPA) to Gōisho Teiketsu" 日本女子プロ将棋協会 (LPSA)と合意書締結 [Agreement signed with LPSA] (in Japanese). 日本将棋連盟 (Japan Shogi Association). 2 June 2014. Archived from the original on 3 July 2014. Retrieved 26 June 2014. ^ "Yoku Aru Goshitsumon: Naze, Dansei wa "Kishi" na no ni, Josei wa "Joryūkishi" to Naru no Desuka" よくあるご質問：なぜ、男性は「棋士」なのに、女性は「女流棋士」となるのですか。 [FAQ: Why are men referred to as "kishi" and women referred to as "joryūkishi"?] (in Japanese). 日本将棋連盟 (Japan Shogi Association). Retrieved 28 June 2014. ^ Andreas Neumaier (2018-05-20). "FESA home page - Ratings". Shogi.net. Retrieved 2018-06-05. ^ "Shogi pros warned not to play computers". The Japan Times. Tokyo, Japan. 16 October 2005. Retrieved 28 November 2011. ^ "Top female 'shogi' pro falls to computer". Japan Times. Kyodo. 12 October 2010. Retrieved 17 December 2014. ^ "Shōgi Sofuto ni Amagumi Kanpai: Hijutsu, Ikki ni Semetsubusareru" 将棋ソフトにアマ組完敗　秘術、一気に攻めつぶされる [Shogi computer programs crush amateurs]. The Asahi Shimbun (in Japanese). 2 August 2011. Retrieved 17 December 2014. ^ "Dainikai Shōgi Denōsen Daigokyoku Miura Hiroyuki vs GPS Shōgi" 第2回 将棋電王戦 第5局 三浦弘行八段 vs GPS将棋 [Second Shogi Denosen, Game 5: Hiroyuki Miura 8 dan vs. GPS Shogi] (in Japanese). Niwango. Retrieved 17 December 2014. ^ "Computer program Bonkras highest rated player on Shogi Club 24" (in Japanese). Shogi Club 24. ^ Shinji, Fukamatsu. "AI beats top shogi player in first match of tournament final：The Asahi Shimbun". The Asahi Shimbun. Retrieved 17 May 2016. ^ "DeepMind's AI became a superhuman chess player in a few hours, just for fun". The Verge. Retrieved 2017-12-06. ^ H. Adachi; H. Kamekawa; S. Iwata (1987). "Shogi on n × n board is complete in exponential time". Trans. IEICE. J70-D: 1843–1852. ^ Fairbairn, John. 1982. esorH drawkcaB ehT. Shogi, 37, p. 18. ^ "A Lion's Play of Words". Nihonden. 2017-03-08. Retrieved 2017-03-09. Aono, Teruichi (1983). Better Moves for Better Shogi. translated by John Fairbairn. Tokyo, Japan: Sankaido Publishing Co., Ltd. ISBN 978-4381005977. Aono, Teruichi (1983). Guide to Shogi Openings: Shogi Problems in Japanese and English. translated by John Fairbairn. Tokyo, Japan: Sankaido Publishing Co., Ltd. ISBN 978-4381005984. Fairbairn, John (1986). Shogi for beginners (2nd ed.). Ishi Press. ISBN 978-4-8718-720-10. Habu, Yoshiharu; Hosking, Tony (2000). Habu's Words. translated by Tony Hosking and Yamato Takahashi [ja]. Stratford-upon-Avon, England: The Shogi Foundation. ISBN 978-0953108923. Hosking, Tony (1997). The Art of Shogi. Stratford-upon-Avon, England: The Shogi Foundation. ISBN 978-0953108909. Hosking, Tony (2006). Classic Shogi: Games Collection. Stratford-upon-Avon, England: The Shogi Foundation. ISBN 978-0953108930. Pritchard, D. B. (1994). "Shogi". The Encyclopedia of Chess Variants. Games & Puzzles Publications. pp. 269–79. ISBN 0-9524142-0-1. Yebisu, Miles (2016). Comprehensive shogi guide in English: How to play Japanese chess. Laboratory Publishing. Wikimedia Commons has media related to Shōgi. boardspace.net real time play against human or (weak) computer players. This page was last edited on 24 April 2019, at 10:42 (UTC).